from 15 July to 22 September. simultaneously in New Zealand and the UK. to be viewed at the same time on opposite sides of the world. This highlights the democratic nature of printmaking and questions the aura of the unique. Which venue is showing the ‘real’ work? Which the reproduction? Parallel Prints features the work of 12 diverse artists presented in a portfolio set. and the writer and critic Richard Noyce has supplied an introductory essay. There are 24 portfolio sets, one for each artist and 12 for donation to international collections. Margaret Ashman, Duncan Bullen, Anne Desmet, David Ferry, Gillian Golding, Mark Graver, Weimin He, Timo Lehtonen, Johanna Love, Stephen Mumberson, Chris Pig and Sandy Sykes. 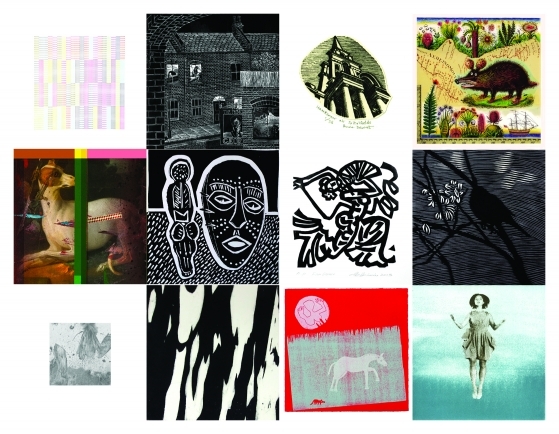 These artists represent the broad diversity of current printmaking process and practice. and in the UK at Ian Rastrick Fine Art, St.Albans, from 9-16 August. allowing the audience to encounter both exhibitions at once. There will also a live web video streaming of the New Zealand exhibition available. for exhibition at Galerie Apart, Le Bourg , Marcilhac-sur-Cele in October. at the Impact 8 international printmaking conference in Dundee, Scotland on 31 August. 12 of the portfolio sets to international collections. to find homes for the remaining folios. and future versions are planned for the USA, China, India and Thailand. Cool. I might have to take a trip up to KeriKeri!